*HEALTHY ‘N FIT® Correct Proportion™ BCAA’s are unique and different than those found in a protein product—they are 100% pure pharmaceutical grade Free Form Amino Acids, and have the quickest absorption and fastest delivery of amino acids to muscle target tissue, even more so than Whey protein. *HEALTHY ‘N FIT® was first to introduce groundbreaking technology to take BCAA’s (Branched Chain Amino Acids) to a higher level of efficacy. Before HEALTHY‘N FIT®, typical dosages of BCAA’s were low potency and improperly formulated with the same or equal ratio, containing 500 mg. each of L-Isoleucine, L-Leucine and L-Valine. Today you’ll see many brands boasting of “ratio technology” which we created decades ago. However, other brands can‘t seem to agree on the correct proportion (also known as ratio or profile) of BCAA’s in their product to produce the most effective formulation, and while virtually every brand has a different ratio, each claims that theirs is “the best”. *While BCAA’s can be quite effective, they should be taken in their correct proportion to produce the highest effectiveness. In determining the correct and most effective proportion (ratio, profile), HEALTHY ‘N FIT® utilizes Correct Proportion Ratio Technology™, which is based on the advanced methodology for the quality and effectiveness of amino acids known as the Amino Acids Chemical Score (AACS). AACS is based on the amino acids profile and how it most closely matches what is needed by the human body. To determine the best AACS, we looked to the highest quality sources of naturally occurring amino acids – Egg Protein and Whey Protein. These sources have shown to be the most effective sources of naturally occurring amino acids for building muscle mass and strength. The ratio of BCAA’s that we use is based on these sources. Products that are “high ratio”/”Leucine heavy”, meaning that L-Leucine has a much higher potency than L-Isoleucine and L-Valine (such as 3:1:1, 4:1:1, 8:1:1), may appear impressive to some, however in reality they upset the natural balance of the BCAA’s trio of amino acids, and are antagonistic and counterproductive to the product’s or BCAA’s AACS, hence its effectiveness. Furthering the problem, “high ratio” Leucine or “Leucine-heavy” products are also too low in the two other very effective BCAA’s, L- Isoleucine and L-Valine. Therefore, HEALTHY ‘N FIT® Correct Proportion™ BCAA’s are not high ratio Leucine or Leucine-heavy, and contain the correct and most effective ratio and potency of L-Leucine, L-Isoleucine, and L-Valine, and have the highest BCAA’s Amino Acids Chemical Score. BCAA’s in a 2:1:1 ratio are closer to the correct ratio, but are still not in the ideal ratio as are HEALTHY ‘N FIT® Correct Proportion™ BCAA’s at a ratio of 1.60:1.25:1. Other Ingredients (may contain any of the following): Magnesium Stearate, Microcrystalline Cellulose, Dicalcium Phosphate, Silica, Calcium Sulfate, Croscarmellose Sodium, Pharmaceutical Glaze, Carnauba Wax, Titanium Dioxide. Suggested Use: As a dietary supplement, take 3 to 6 tablets daily. Best when taken after training; on non-training days take between meals. Q: When it comes to BCAA’s it can be so confusing, almost every company has a different ratio and some BCAA’s are called high ratio or leucine heavy, and they all say that they have the most effective ratio-please help…. A: The scientific literature indicates that BCAA’s can be quite effective, however to produce the highest effectiveness they should be formulated and taken in their correct proportion, also known as ratio or profile. Today, every company’s ads claim that they have the best BCAA’s ratio. 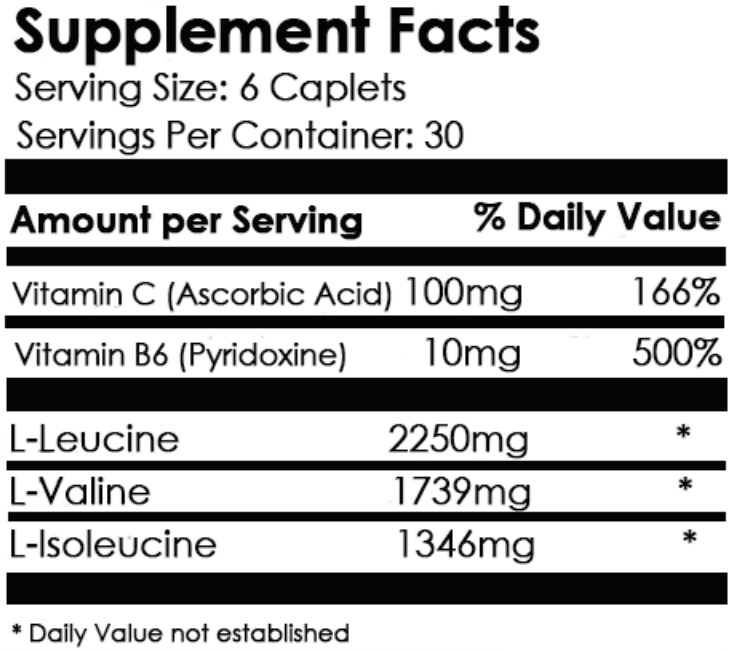 Some companies simply try to outdo each other by having higher and higher ratios, 3:1:1, 4:1:1, even 10:1:1 of their L-Leucine potency being higher than the other two amino acids that make up the BCAA’s trio of amino acids (which are L-Isoleucine and L-Valine). As it is in any industry, not every company has the resources, knowledge, and expertise of their industry, and simply copy or try to top what’s popular. As we know, in many cases and in many different industries what is perceived as popular or temporarily popular (usually by expensive fancy marketing or celebrity endorsements) is not always what is best. The correct proportion should not be based on opinion, fancy marketing, hype, or paid drugged-up bodybuilder endorsements, but rather, it should be based on solid science, not pseudo-science or a brand’s “marketing quasi-science” geared to sell their products. To give you a brief background…. Before most sports Nutrition Companies existed, HEALTHY ‘N FIT® introduced to the supplement industry, the first BCAA’s ratio technology called Correct Proportion Ratio Technology™. Correct Proportion Ratio Technology™ is based on the advanced methodology of quality and effectiveness for amino acids known as Amino Acids Chemical Score (AACS). AACS is based on the amino acid profile, also known as proportion or ratio, and how it most closely matches that needed by the human body. To determine the best AACS, we looked to the highest quality sources of naturally occurring amino acids – Egg Protein and Whey Protein. These sources have shown to be the most effective sources of naturally occurring amino acids for building muscle mass and strength. The ratio of BCAA’s that we use is based on these sources. Products that are “high ratio”/ “Leucine heavy”, meaning that the L-Leucine has a much higher potency than L-Isoleucine or L-Valine (some ratios are 10:1:1, 4:1:1, 3:1:1), may appear impressive to some, however in reality these ratios upset the natural balance of BCAA’s, and are counterproductive and antagonistic to the product or BCAA’s AACS, hence its effectiveness. Furthering the problem, “high ratio” Leucine and “Leucine heavy” products are also too low in the other two very effective BCAA’s, L-Isoleucine and L-Valine that comprise the BCAA’s trio of amino acids. HEALTHY N’ FIT® Correct Proportion BCAA’S™ are not high ratio Leucine or Leucine heavy, and contain the correct and most effective ratio and potency of L-Leucine and L-Isoleucine and L-Valine. BCAA’s in a 2:1:1 ratio are closer to the correct ratio but are still not in the ideal ratio as are HEALTHY N’ FIT® Correct Proportion™ BCAA’S, at a ratio of 1.60:1:25:1- which have the highest AACS of all BCAA’s, and are *Guaranteed to exceed every brand. It may also be interesting to note that L-Isoleucine tends to be the most expensive amino acid and other brands which contain a very high level of the less expensive Leucine may be saving themselves a good deal of money by including such a comparatively small amount of Isoleucine. Q: What can you tell me about the company that produces Correct Proportion BCAA’S? A: What a company has achieved is synonymous with the quality of its product formulations and their efficacy. Look at the company you are purchasing from or thinking of purchasing from, and see what real technology (not marketing hype or the façade of paid drugged-up bodybuilder endorsements) they have brought to the industry. HEALTHY ‘N FIT® has developed and implemented more successful technologies than any brand, in an unprecedented dozen plus product categories. Q: How do other BCAA products compare to Correct Proportion BCAA’S? A: Only HEALTHY N’ FIT® utilizes Correct Proportion Ratio Technology™. Correct Proportion Ratio Technology is based on the advanced methodology of quality and effectiveness for amino acids known as the Amino Acids Chemical Score (AACS). AACS is based on the amino acid profile, also known as proportion or ratio, and how it most closely matches what is needed by the human body. Correct Proportion™ BCAA’S also have a mega dosage potency of over 5000 mg.. Correct Proportion™ BCAA’S have the highest Amino Acid Chemical Score (AACS) of all BCAA’s, and are *Guaranteed to exceed all BCAA products or your money back. Q: Are Correct Proportion BCAA’S safe? A: Correct Proportion™ BCAA’S contain L-Leucine, L-Isoleucine and L-Valine which are essential amino acids. Also included in our formula are supporting nutrients, which are vitamins, and minerals, which are all dietary supplements and as such are safe to use. All ingredients in this product are widely used and have a long history of safety spanning several decades. Q: Do I need to cycle Correct Proportion BCAA’S? A: There are some benefits to cycling certain products. Correct Proportion BCAA’S contain essential amino acids which provide nutritional support for increased muscle mass and strength, anabolic activity, enhanced recovery, enhanced muscle protein synthesis, enhanced anti-catabolic activity and more in combination with your progressive training, and cycling is not required. If you do take a break from training, adequate quality protein should still be ingested, however, you can also take a break from Correct Proportion™ BCAA’S until you resume training. Q: What is the best way for me to take Correct Proportion BCAA’S? A: Generally, the best time to take Correct Proportion BCAA’S is immediately after workouts, between meals, or in the morning upon awakening. The convenient caplet form of this product also makes it very easy to transport and to take Correct Proportion BCAA’s at a time that is convenient for you. *GUARANTEE- Experience the benefits of ANABOLIC AMINO BCAA’s for three weeks, and you must be 100% pleased, or simply return the bottle and unused portion with receipt to HEALTHY ‘N FIT for a full refund of the purchased price. We THANK YOU for our 99% Customer Satisfaction Rate.